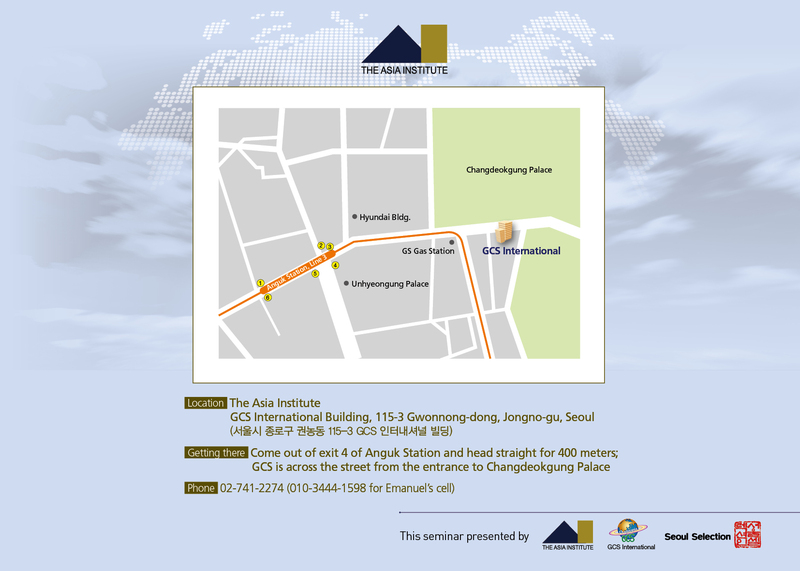 Emanuel Pastreich is the director of the Asia Institute in Seoul, Korea, a think tank that has made the environment and technological change in Asia its central concern. Originally a scholar of classical Chinese literature, and more broadly Asian literature, he has advocated for closer cooperation across Asia to address the profound challenges of our age. He is fluent in Chinese, Japanese and Korean and has recently published a book in Chinese in which he advocates for a new vision of the Chinese economy based in part on traditional Chinese ideas about ecology from Confucianism and Daoism. When I arrived in Nanjing to attend a conference recently, I asked the student assigned to show me around whether he could take me to the famed Confucian temple Fuzimiao in the old city. It was my first visit to Nanjing, and I wanted to explore its back streets and perhaps stop at a traditional tea house. I knew Nanjing — or Jinling as it was known before the Ming Dynasty —even though I had never visited before. I had read many poems set in Nanjing when studying Chinese literature at the University of Tokyo and at Harvard University. The landscape of the Qinghuai River was familiar to me from seventeenth-century miscellanies, and I had fantasized about the sprawling mansions of Nanjing in the eighteenth century when I read the novel Dream of the Red Chamber in college. But my quest for traces of old Jinling in the frenetic streets of contemporary Nanjing was a failure. All traditional buildings around the Fuzimiao Confucian Temple have been torn down and replaced with bland concrete buildings housing fast food restaurants and shops selling t-shirts. Although some stores had fine teas, for the most part the food and the gear available was not much different from that found in Bangkok, or in Los Angeles for that matter. Nothing was manufactured in Nanjing. The city has lost its community of artisans and craftsmen, not to mention its poets and novelists. The interior of the Fuzimiao Confucian Temple did not feel authentic. The walls were formed from poured concrete, not stone or plaster. The woodwork was cut by rough hands, and the corners where the floor met the walls were not carefully finished. The furniture was poorly crafted and the calligraphy hanging on the walls mediocre. I found no grand history that afternoon in Nanjing, nothing like the relics of an inspiring past that you find at Notre Dame in Paris or around the Todaiji Temple in Nara. I got the impression from some explanations that I read that Nanjing’s past is something that Chinese are obligated to read about, but not much in that civilization is relevant to the present day. My student guide was extremely helpful in the search for a traditional teahouse, but I came away with a feeling of deep sadness that so much of traditional China has been lost—not so much because of the Cultural Revolution but from the growth of a ruthless consumer culture. This sadness was most certainly not sentimentality. The true tragedy is that China had at one time offered the world the most sophisticated system for supporting a complex bureaucracy and a large population entirely on the basis of fully sustainable organic agriculture. When the American agronomist F. H. King wrote the bookFarmers of Forty Centuries, or Permanent Agriculture in China, Korea, and Japan in 1911, he argued that East Asia offered a model for truly sustainable agriculture that the United States should adopt as soon as possible. Tragically, China has imported the lethal American mix of fertilizer and pesticides that makes nothing sustainable. The Chinese wisdom of agriculture has been lost on young people at exactly the moment it is most needed. So also, the Chinese traditions of modesty and low consumption, respect for the elderly, and personal humility have tremendous appeal as an alternative to a ruthless consumer society. But if you come to China looking for these virtues, you will be disappointed. Many Westerners are seeking in China an alternative to the deep malaise that infects Western culture. It was a similar impetus that inspired me to study Chinese literature: a disillusionment with the materialism and militarism that were slowly eating away at the institutions that make up the United States. Confucianism, Buddhism, and Daoism offer Americans an alternative to a society in which the individual’s every action is calculated in monetary terms. I was inspired by China as a student because of the appeal of frugality and the commitment to the unity of learning and ethical practice. Many of the great Confucian scholars made it a practice only to eat what they needed and to refrain from indulgence. Even well-off Chinese avoided waste and ostentation and considered literature and philosophy to be the highest calling. China represented a civilization dedicated to tranquility in which villages maintained a careful harmony with nature that assured their survival for centuries. But when I visit China today, I find the same blind worship of the false gods that I wanted to leave behind in the United States. I am shocked to see the pointless waste of food at restaurants in China, and the impulsive, needless purchase of unnecessary products and accessories by Chinese. Such actions would have been seen as shameful by Chinese 100 years ago—and such consumption is shameful today in this age of radical climate change. Today most young Chinese throw away plastic bottles and bags like their American peers, without a thought for the consequences. Most tragically, Chinese bureaucrats also evaluate success according to the same twisted economic theories and fetishisms that have done such damage in the West. Chinese are drawn to fancy department stores packed with disposable goods, and they view flashy fighter planes as symbols of national power. I am sensitive to this shift because as an American I have watched my own country lose its way, its citizens seeking shelter from the harsher realities of society in consumer fantasies. America has failed miserably to set an ethical model for the world. Not only has my country engaged in a series of illegal wars for over almost two decades, Americans have become so narcissistic that they make no effort to set higher standards for the world to follow in terms of environmental policy or their concern for those who do not have the benefits of wealth. China, meanwhile, is setting the pace for developing nations around the world today. The nations of Africa and Asia turn to China as a model of successful development and receive an increasing amount of aid from Beijing. China has an impact on the world unlike any other country because one out of five people live in China. China’s culture is impacting nations in Africa and South America directly, and many from developing nations are scrambling to learn Chinese. China has the tremendous wisdom and depth in its culture, a long tradition of sustainable agriculture and low-consumption intellectual engagement that could provide an alternative for development. China is not offering a fundamental alternative to the consumption-based U.S. model. Many Chinese imagine a strong China that can stand up for its interests and leave behind forever the humiliations it suffered after the Opium Wars (1839-1842; 1856-1860). The desire on the part of Chinese to build up national strength to resist foreign powers is understandable. Unfortunately, the assertion of national power often takes the form of imitating the trappings of national power so loved by the United States, such as the building of aircraft carriers and tanks, rather than a commitment to addressing real security threats like climate change. The debate in China has been whether China should further embrace neoliberalism, or revive its Maoist traditions. The return to traditional approaches to economics, ecology, and governance have not been considered as a third way. President Xi Jinping introduced the “Chinese Dream” in the midst of the debate on how far to take Chinese globalization. Xi used the term “Chinese Dream” (Zhongguomeng) in November 2012 after the 18th National Congress of the Communist Party of China, predicting a “rejuvenation of China” that would take the form of “a dream of the whole nation, as well as of every individual.” Although the dream was presented as a spiritual challenge to citizens to work together for a better country, and a better world, for many Chinese the “Chinese dream” means simply a rich China packed with big cars, long highways, soaring skyscrapers, and stores packed with consumer goods. They dream of a day that they can eat at expensive restaurants and order so much food that they leave piles of it behind. Many see Chinese see the Western good life as progress even as we observe all around us signs of impending doom. We should not glorify traditional China, given the rigidity of Confucian teaching in the late imperial period and the severe limitations on the activities of women. At the same time, Chinese should see their past not as something to overcome but as an inspiration for the future. Chinese culture assumed that students were to be trained to read poetry from childhood and should study ethics and philosophy, rather than business administration and marketing. Intellectuals were expected to maintain a commitment to society and to good governance, and government officials were expected to be intellectuals who valued the humanities above all. What we need is something closer to what E. F. Schumacher referred to as the “middle way” between “materialist heedlessness” and “traditional immobility” in his book Small is Beautiful: Economics as if People Mattered. China did not grow economically by exploiting the peoples of the world and their natural resources in the way that Europeans and Americans did, and still do. Perhaps we can imagine a world in the future in which China, rather than joining the club of rapacious globalists, returns to its original roots in a sustainable economy that values the humanities and wisdom above all, and reinterpret this as a “Chinese dream” for all Chinese as well as for the developing world. The Chinese must incorporate into their dream a focus on long-term economic and environmental justice — values that in many respects form the core of the Confucian and Daoist tradition. China should draw on its tradition of ecology and political ethics as the foundation for a new worldview that offers alternatives to “economic growth” metrics and “consumer indexes.” China has the philosophical foundations — the aesthetic — required to build such an intellectual institution. Chinese in the Ming and Qing dynasty were entirely capable of formulating and implementing agricultural and irrigation plans spanning centuries. Perhaps the rediscovery of traditional Chinese concepts of sustainable agriculture will serve as the necessary stimulus to create a “synthesis that will fuse economics and environmentalism in a way that fundamentally reorients both disciplines,” as John Feffer suggested in his article “The New Marx.” The question is whether Chinese are ready to recognize the treasure that they already hold in their hands. Whether China is equipped to play a lead role in the world is not relevant. China has been thrust to center stage by circumstances, ready or not. The deep decay of American culture over the last three decades, combined with the striking irresponsibility of American intellectuals, has left the United States embroiled in international and domestic problems that will prevent it from such central role in the international community, regardless of what American media may say. China is the only country that has the financial assets, the expertise in the sciences, the scale and the depth in its institutions and culture to play such a global role. Moreover, because China was a hegemon in Asia, but not a colonial power in the sense that England, France, Spain, and Germany were, there is a chance that China will promote a level playing field around the world. But that last point is far from guaranteed. The critical question is whether China has the creativity and the moral authority to stand back from the excitement of wealth and power and critically assess how its traditional culture offers a viable alternative for both China and the world. The majority of Chinese still have not grasped the fact that it is now China’s responsibility, and not merely its opportunity, to advocate for the rule of law, for a peaceful world, and for a better sustainable future around the world. Some countries choose to offer an alternative, and some countries have that responsibility thrust upon them. China finds itself in the latter position, and the world awaits China’s decision. Exactly at this moment, when China is called upon to play a central role in the global economy, the country has launched its “One Belt One Road” project. China has invited nations from around the world to participate in this project to promote integration and cooperation among the nations of Eurasia. The “One Belt One Road” has focused on infrastructure and resource development so far. These projects can sometimes be useful for developing a sustainable future, but in many cases are not. Emphasis has been placed on increasing the flow of oil, gas, and other raw materials into China to fuel further growth and investment. The Asian Infrastructure Investment Bank (AIIB), the New Silk Road Fund (NSRF), the Shanghai Cooperation Organization (SCO), the Silk Road Gold Fund, and the Mining Industry Development Fund have little to do with preserving the environment. This drive towards consumption as national strength does not bode well as Chinese consumption of food and fuel has such an impact on the entire world, as Lester Brown has demonstrated in his book Who will Feed China? Still, the project is just beginning, and China may ultimately use this project to establish new institutions, policies, and habits that lead the Earth in the right direction. “One Belt One Road” is an unprecedented opportunity for two reasons. It is an opportunity to establish a new international community that follows directly the prescriptions of the United Nations charter, a tradition that has been all but forgotten in Europe and the United States. But it also offers us the possibility of establishing institutions for global governance appropriate to a densely integrated Earth that are not dominated by private equity funds and multinational corporations in the manner that the World Bank is. The “One Belt One Road” project requires global cooperation and cannot be dictated by China. That fact also offers a rare chance to create new institutions of consensus that are not run by superpowers, but that potential can only be realized if other nations take the project seriously as a plan for humanity, not just a chance to make money. China should also think more profoundly about the common term for this project, the “new silk road.” The term “silk road” harkens back to the overland trade between China and the rest of Eurasia in the Tang Dynasty through trading centers such as Samarkand and Andijon and over the sea route connecting China with India, Persia, and Africa. But the silk road was not just about money and trade. The silk road also refers to the profound cultural exchanges between China, central Asia, India, and Persia that resulted in the flowering of Buddhist philosophy, the exquisite murals of the Dunhuang Caves, the delicate porcelain and sculpture of Changan, and the lyrical poetry of Li Bai and Du Fu in Tang Dynasty that set the course for the rest of Chinese literary history. Might this new silk road avoid the well-worn path of Western-style economic development and put its sights on achieving the highest levels of cultural expression? Or could it put more emphasis on organic farming than on building dozens of new airports? Might joint projects to improve the production of sustainable energy replace the extraction of fuel and metals? At the moment there are few indications of such a shift. But China has demonstrated such radical transformations in the past. China has the solution in its past, although many Chinese are unaware of it. Perhaps China’s past offers that last opportunity for our tortured world. I have not been in Suzhou since 1991. I remember the old canals that I had read about so often were being rebuilt and prettied up in ways that I must say were not exactly to my liking. Suzhou was changing quite rapidly at the time and I felt I could see something slipping away before my eyes. 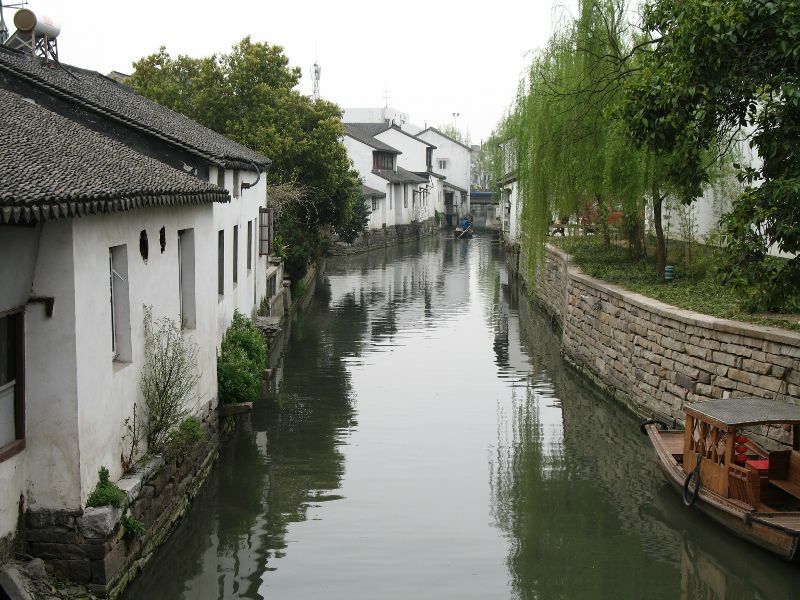 The canals of Suzhou embody the understated wealth and erudition of this intellectual mecca. If I had to imagine an ideal hope, perhaps Suzhou of the Ming Dynasty would be it. But now an enormous “Gate to the East” 东方之门 is rising above Suzhou that dwarfs everything else. Two towers come together as one, perhaps symbolizing a marriage of East and West, or of past and present.